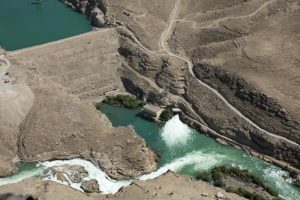 Iran is said to be providing the Afghan Taliban with the means to disable some of Afghanistan’s dams so Teheran can get a larger share of water for itself, a report said. Governors in Afghanistan’s southern and western provinces accused Iran of using an increasingly close relationship with the Afghan Taliban to target power and water projects on Teheran’s behalf, Voice of America (VOA) reported on Jan. 23. The Kajaki Dam in Helmand province, Afghanistan. Hayatullah Hayat, the governor of southern Helmand province, told VOA’s Afghan service that Iran wants to disable the Afghan dams in order to get more water from the Helmand River. Water scarcity is a major issue in the region. Iran and Afghanistan signed a water-sharing treaty in 1973 which says that Iran shall not make claims to water from the Helmand River in excess of amounts agreed to in the treaty, even if additional water becomes available in the future. Hayat said Iran’s elite Islamic Revolutionary Guard Corps (IRGC) is providing the Taliban weapons that could be used to attack Afghan infrastructure. He said several unexploded mortar missiles used by the Taliban bore an Iranian manufacturer’s mark and were fired at the Helmand provincial capital. The Taliban has increased its terror activities in various provinces, Afghan officials say. “The abundance of new weapons and ammunitions in Taliban’s possession has created many questions and doubts,” Asif Nang, the governor of western Farah province told VOA. Nang added that the Taliban can receive weapons “within an hour” from Iran, given the proximity of his province to the border. Nang also accused Iran of harboring Taliban families in its territory. Hayat added that Iranian intelligence representatives recently met with local Taliban leaders in Helmand’s Garmser district. Iran’s Embassy in Kabul declined to comment on Jan. 23 when contacted by VOA. Teheran has said it has close relations with the Kabul government, but denied accusations of a close association with the Taliban. Afghan President Ashraf Ghani said that Iran continues to receive its share of water from Helmand River and that the country cannot claim more than what has been agreed upon. Some Afghan analysts say that if Iran wants more water, it should cut a deal with Afghanistan.